And countless movement collaborators, participants and documentarians. Installation in Take This Hammer: Art + Media Activism from the Bay Area, Yerba Buena Center the Arts, curated by Christian Frock. 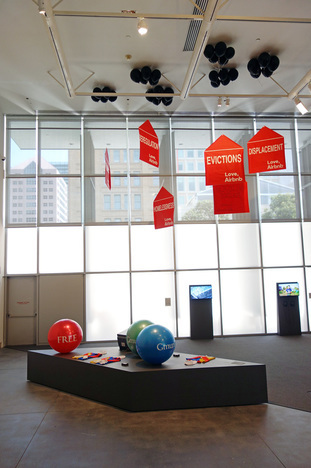 Installation of balloon banner replicas (paper, paint, balsa wood, monofilament, helium balloons) and documentation from unsanctioned installation/intervention at Airbnb’s San Francisco headquarters. I designed and organized this intervention with Housing Rights Committee of San Francisco, Coalition on Homelessness, Causa Justa/Just Cause, Plaza 16 Coalition, San Francisco Tenants Union, California Nurses Association, Jobs with Justice, St. James Infirmary, TGIJP, Brass Liberation Orchestra, Azin Seraj (cameraperson), Jadelynn Stahl and Zeph Fishlyn (production assistants). Installation of Gmuni: Free Luxury Free Market Free for All and Reclaim Disrupt. 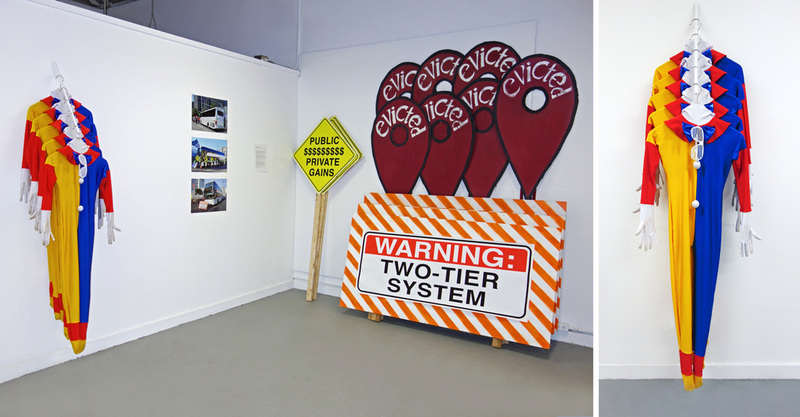 ​Documentation and ephemera from both public intervention projects. I launched this project in 2014 at TechCrunch Disrupt (one of the tech industry's biggest conferences of the year). 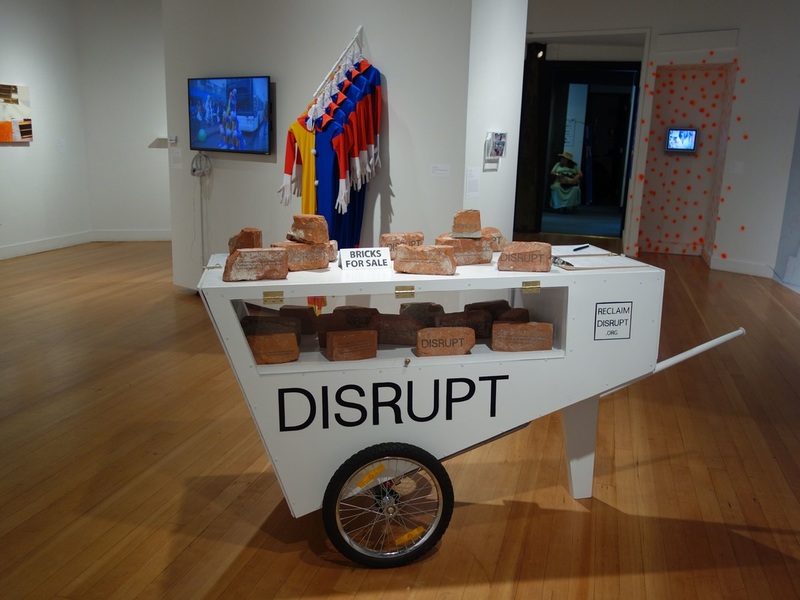 The bricks, sourced from a San Francisco demolition site, were laser etched with stories of those who have been evicted or are facing eviction. They were for sale for the price of one's hourly wage or the hourly gain of one's net wealth (half of that price if the buyer had been evicted). This elicited conversations about who is valued in the city, who is deemed replaceable and what is lost as rooted communities are disrupted and displaced as the tech boom continues to fuel real estate speculation. The project resurfaced at different locations around the Bay and its documentation and archive of collected stories was shown at the Berkeley Center for New Media Commons. Real estate speculators are capitalizing on the influx of high-wage earners by evicting long-time residents to rent units at inflated rates, commanding up to twenty percent more around tech shuttle stops. Meanwhile our city officials are privileging the tech industry and giving away public assets despite the outcry. Heart of the City, along with the growing movement demanding a right to the city, will continue to fight to save our city refuge and neighborhoods and encourages others to do the same in their communities. Archival materials from an anti-gentrification and displacement spectacle staged at the San Francisco Pride Parade. The contingent included a parody of a “Google Bus”, slick, private buses shuttling tech workers to and from Silicon Valley, which spelled "G.E.T. OUT" on its side, and it rolled through the parade sandwiched between contingents from Google and Dropbox. The spectacle is an indictment of the Bay Area tech boom that has brought with it young, newly wealthy corporate employees interested in living in the SF/Bay Area rather than the South Bay where they work. This influx of tech workers has caused real estate and rental prices in San Francisco to skyrocket, displacing the populations that once constituted the "heart" of the city.